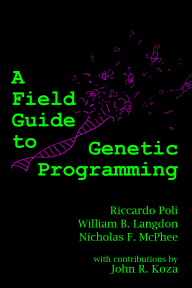 A Field Guide to Genetic Programming: One heck of a party! 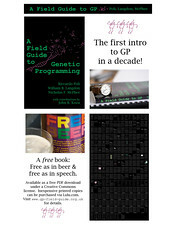 Last night's unveiling of A Field Guide to Genetic Programming was a huge success! We had one of the poster "stalls" with 50 copies of the book that we'd purchased from Lulu as our initial "print run". We were wearing cool t-shirts sporting that wonderful cover, had the nice poster shown to the right, and even had spiffy postcards with the cover to give away. The book was a big hit with the Evo* crowd, and we sold out the full set of 50 pretty quickly. Lots of folks had us autograph their copies, many of which are now destined to be collector's items with the signatures of all three of the authors. Some even have the signature of Tyler Hutchison, who did the nifty cover art for us and helped a lot with the roll-out. As mentioned before, the book is now officially released and available to any and all via lulu.com, both in an inexpensive printed form (what we were selling last night) and as a free downloadable PDF. So go check it out - 50 whole Field Guide fans can't be wrong!